European University Sports Association (EUSA) is happy to report a big interest for this year's European Universities Championships, and that it is still possible to register through the national university sports bodies in European countries. 23 sports are offered in the 2019 EUSA sports programme: Badminton, Basketball, 3x3 Basketball, Beach Handball, Beach Volleyball, Combat Sports (Judo, Karate, Kickboxing, Taekwondo), Football, Futsal, Golf, Handball, Mind Sports (Bridge, Chess), Orienteering, Rowing, Rugby 7s, Sport Climbing, Table Tennis, Tennis, Volleyball and Water Polo. 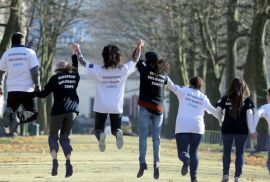 European University Sports Association and the EUSA Institute are announcing the deadline for application for the next round of volunteering projects under European Solidarity Corps - ESC (successor of European Voluntary Service - EVS) within our organisation. The foreseen service in EUSA for this call is one year; the next available term is from September 1, 2019 to August 31, 2020. Deadline to apply is January 21, 2019. 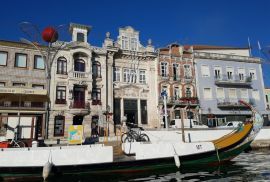 Between September 25 and 28, the Portuguese city of Aveiro will host the main anniversary events of the European University Sports Association (EUSA) - the EUSA Conference, Assembly and Gala. 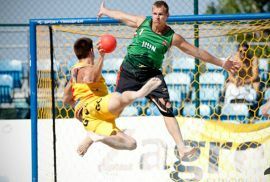 The first EUSA-EHF European Universities Beach Handball Championship is to be hosted in Croatian capital Zagreb between July 24 and 27, 2019. An inspection visit was held in Zagreb on January 18-19, attended by EUSA Sports Manager Mr Besim Aliti, EUSA Beach Handball Technical Delegate Ms Jelena Rakonjac and EHF Beach Handball Commission member Mr Marco Trespidi, finalising the preparation for the event. 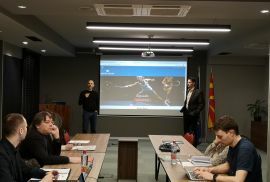 Partners of the Erasmus+ supported project Smart Sport on dual career and innovative technologies met in Skopje (MKD) for their first meeting in 2019. 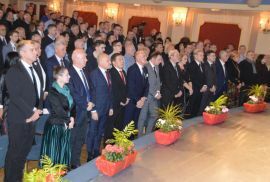 The meeting was hosted by one of the project partners, the Macedonian Olympic Committee, and took place at the Park Hotel and Spa on January 23 and 24. 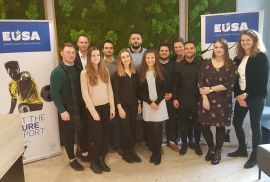 European University Sports Association (EUSA) hosted a meeting of its Student Commission in Ljubljana, Slovenia between January 25 and 27, 2019. This was the first meeting of the new composition of the EUSA Student Commission, joint by the outgoing members in order to assure knowledge transfer. On February 24, the annual sports awards, recognising the most successful athletes in Bosnia and Herzegovina of the previous season took place at the National Theatre in Sarajevo. EUSA President also attended the 74th awarding ceremony. 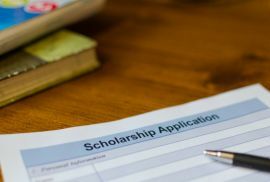 If you are a university student or graduate, and are looking to experience sports studies abroad, we would like to draw your attention to a few study programmes and scholarship opportunities for the next academic year. The home of university sports is gearing up for what will be a momentous year for many reasons. 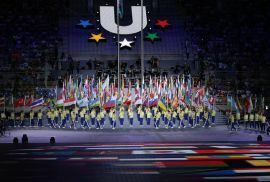 2018 saw many firsts and some impressive records set for FISU, the International University Sports Federation, but 2019 promises to be all that and even more! As FISU marches ahead, proudly brandishing its rich history, they are calling this the Year of Legacy. The focus of this month’s column is on gender equality, from a perspective of young sport leaders, introducing the New Leaders project. On the 21-23rd of January in Vilnius, Lithuania, 30 young sport leaders from the New Leaders project gathered to begin the year long journey that will develop their leadership skills and help them become advocates for gender equality in the sporting world. The aim of the programme is to empower and equip emerging sport leaders with the tools to learn, speak up and, most importantly, the ability to act in order to transform the sport movement for the better. At the first workshop participants worked on their personal and professional goals, which are followed by concrete personal and organisational action plans to transform the sport movement. Going forward the participants will analyse the current status quo in relation both to their own organisation, and from a national context, reflecting on how the IOC Gender Equality Recommendations are met, and what actions should be done to reach a more balanced sporting world. Main objectives of the New Leaders programme are to strengthen leadership skills and knowledge of decision-making in sport to attain good governance; create a network of value-based modern leaders; increase the number of female decision-makers; and implement the IOC Gender Equality Recommendations. - 17 National Olympic Committees (NOC-s) out of 206 are headed by female presidents. The gender gap pervades all levels of the sporting world, as evidenced by the fact we have 50% less female volunteers in sports and less women and girls practicing sport on a regular basis. The participation gap is most prevalent in the 15-24 year age group, where a staggering 33% of young women state they never exercise or play sport. This troubling pattern continues when it comes to the portrayal of women in sport, as only 4% of sports media content is dedicated to women’s sport. This is a vicious cycle, whereby women are underrepresented at all levels of the sporting world, but despite this being an established fact, with a myriad of research supporting it, change is slow to happen. Put it this way, if somehow you are still wondering why gender equality matters at all - besides the obvious social and moral reasons: we are missing out on 50% of the world’s population reaching their full potential, which in turn has a huge economic impact. That is not to say that progress is not being made, but the progress is simply too ponderous for anyone alive to see the gender gap visibly close within our lifetime. The World Economic Forum publishes the Global Gender Gap Report annually, and it predicts that at the rate of current progress, it will take another 202 years to close the gender gap. Personally, I do not have that much time and neither do the 6 generations after me who don’t have access to equal opportunities due to their gender. I also know that there are an abundance of likeminded fellow sport enthusiasts who will help us in our fight for this cause. The New Leaders project aims to empower young leaders in advocating for a sports world with far greater gender balance, thus killing two birds with one stone, and speeding up the cultural shift towards a more diverse, inclusive, and transparent sporting world. If this cause speaks to you, get in touch, become a #changemaker and let us develop this movement together! The New Leaders Programme was initiated by Birgitta Kervinen, IOC Women and Sport World Trophy Winner 2017, who shared her motivational words with the participants: “One person can create change, but many people can generate a movement – and set standards for the new normal. I believe institutional transformation begins with empowering and equipping new leaders with powerful tools. Your voice is a super power – you just must learn how to use it.” These words are a great reminder for everyone working in this field who wants to make changes that they are not alone, and that by raising our voices, pushing for change, and helping to empower others we can re-define what is the status quo in the sport sector, without having to wait 200 years to do so. The ball is in our court, so let’s build a strong team behind it! 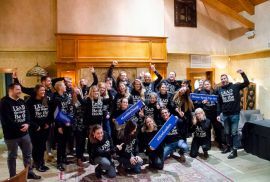 The New Leaders Programme is a joint educational effort of the International Olympic Committee (IOC), European Olympic Committees (EOC), which is ran by the Finnish Olympic Committee in order to develop the skills of 30 young European sport leaders to act as gender equality advocates. In addition to online learning, three workshops across Europe will take place, culminating with a final conference in November in Helsinki, Finland. You can read more about the project at www.newleaders.fi. The author Laura-Maria Tiidla is a New Leaders participant from Estonia, has a Masters of Law from the University of Tartu and works as a Project Manager at the International Sport and Culture Association (ISCA). This email has been sent to . You are receiving the European University Sports Newsletter as our registered user. To change your settings, please edit your preferences for .